When a person signs an agreement with Agreement Express there are several actions that take place to ensure both the integrity and legal authority of the document remains intact. The paperclip watermark that we place on the last page of signed documents is one of our security actions, as is the entire audit trail you can see in the Agreement Details. After all signatures have been completed Agreement Express will finish writing these audit trails, and then sign the document with the Recombo signing certificate. By doing this we not only create a permanent record of the document at the last point of signing, but we also create a crumb trail that will lead users back to us if they are ever working with the just the PDF copy. Expanding on the signature details you will also find our certificate embedded in the PDF as “portable proof” the document has not been altered since it was signed. 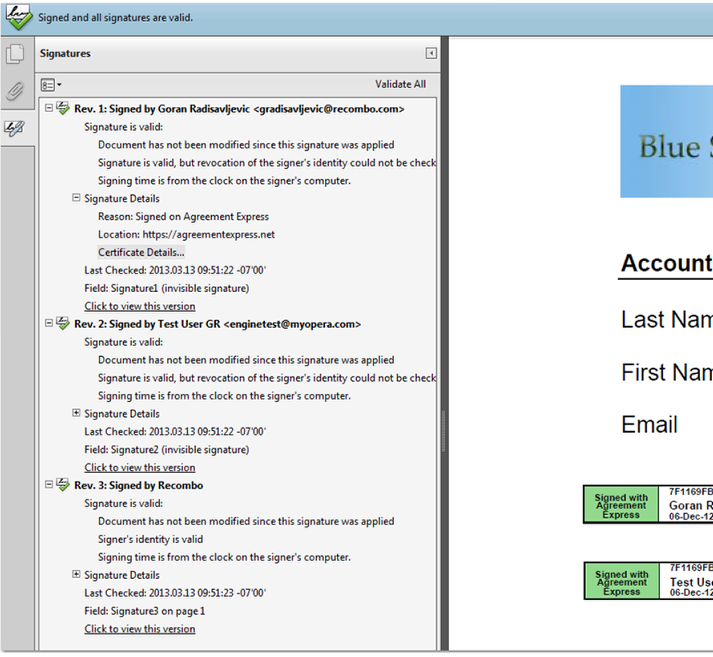 New customers will be using Personal Signing Certificates (PSC’s) where Agreement Express embeds one certificate per signer in the PDF, in addition to Recombo's certificate. The screen shot below shows what this will look like if you view the PDF details. Although Adobe Reader formats this in a more complex manner than our signing details, it essentially contains the same information. This means that every PDF downloaded will contains the trail of signers embedded with an audit trail of time stamp etc.. The model we are using follows the X.509 certificate specification for signing certificates. By following this standard we are positioning ourselves to achieve very high levels of certification as a product when used for signing. To the users there are essentially no changes for them, other than the fact that the registration panel now requires signers to include their City and Province/State. Under the certificate requirements these are fields which are necessary for us to retain. Since we don’t have City and Province/State for previously registered users there are circumstances where we may have an X.509 certificate for one signer, but not for another. This is fine. In this case the audit trail will show any of the X.509 registered signers and Recombo, but the non X.509 certificate users will be in the Agreement Details as they are today, they just won’t be in the PDF audit trail. See below for an example of this.